My name is Stephanie Zonis, and welcome to Organic Matter for August, 2006. Everyone knows maple syrup, and chances are you have fond memories of pouring it liberally over pancakes or waffles or French toast. But organic maple syrup may be a new concept to you. How does it differ from syrup that’s conventionally produced, and does maple syrup really need to be organic? As usual, the answers depend on who’s giving them. Before we begin, as a side note, if you’re watching your intake of calories these days, you might be tempted to dismiss maple syrup as too caloric for frequent use. One tablespoon of maple syrup contains around 40 calories; a tablespoon of sugar has 50 calories, a tablespoon of honey has 64 calories. 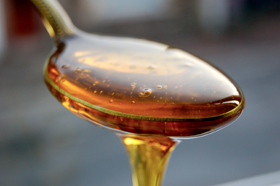 Unlike some other sweeteners, however, maple syrup (and I’m talking only about the real stuff here) is a great source of manganese; that single tablespoon provides over 20% of your recommended daily intake (manganese is a key cofactor in certain enzymes and antioxidants). Maple syrup also contains a bit of zinc along with that rich flavor we all love. Let’s start with some background on maple syrup production. It seems a simple matter: you tap a few trees, boil down their sap, and the result is maple syrup. But, like anything else, “sugaring,” as it’s called, is a little world unto itself. Maple syrup is produced only in the Northeast and Upper Midwest of the U.S. as well as Eastern Canada, home of the sugar maple tree, Acer saccharum. The production of maple syrup begins with sugar, produced in the tree’s leaves during photosynthesis. The sugar is stored in the tree’s wood during winter, then converted to sucrose and liquefied in the sap. In early spring, it’s common for temperatures in sugar maple country to rise above freezing during the day, then fall back below freezing again at night. During those times when the temperatures are comparatively warmer, pressure rises in the tree, and sap will flow. When temperatures fall below freezing, the reverse occurs; sap is drawn back into the tree and flows no longer. Sap production season is brief! When temperatures rise above the freeze-thaw night-to-day cycle, the sap stops flowing for the season. In a good year, sap will flow for about 6 weeks. But sugar maple trees won’t just give you their sap; you have to “tap” them, as the process is called. This means you must drill a hole in the tree, insert a tapping spout (sometimes called a “spile”) with a hook on it, then hang a collecting bucket with a cover onto the hook (that’s the old-fashioned method, or one for those with only a few trees to tap; more modern operations or those with many acres of trees use vacuum tubing, which, done correctly, doesn’t hurt the tree). But wait! You can’t start tapping your trees when they’re too young or small; you can damage them seriously if you do that. You must also take care not to have too many tapholes per tree. Most sources indicate that a healthy tree 10 to 12 inches in diameter (as measured 4-1/2 feet above the ground) can support one tap per season; if the tree is between 18 and 24 inches in diameter, two taps are called for. Incidentally, a sugar maple can take 40 years to achieve that 10-inch diameter! A tree will usually produce from 10 to 20 gallons of sap per year, depending on the weather, method used to collect the sap, and other factors, and some trees have been known to produce sap for over a century. Remember, the sap will flow every day during the season when the temperature rises above freezing, so you must be prepared to collect and store it. Many producers have holding tanks for sap, but the sap cannot be held for more than three or four days, or microbial growth will spoil it. Hopefully, your holding tank isn’t too far from your sugarhouse (also called a “sugar shed” or “sugar shack”), the place where the boiling is done. (The one in the photo is at Coombs Family Farms in Brattleboro, Vermont.) Most sap is 96% to 98% water, and a good deal of the water must be boiled off before the maple syrup can assume its customary viscosity and sweetness. The boiling process assists in developing characteristic maple flavor and color, too. You’ll need an evaporating pan, or evaporating unit, with enough space beneath it for a good fire. Traditionally, that fire was wood-based, but nowadays people use everything from wood to coal to propane as fuel. A small evaporator (2 feet by 6 feet) might have a capability of boiling down 25 gallons of sap per hour, but a large evaporator can handle over 375 gallons in that time! Attention must be paid to the boiling sap, because the time necessary for boiling will vary, according to the weather, sugar content of the syrup, heat from the fire, etc. As you might expect, the amount of syrup produced compared to the amount of sap harvested is quite small. Maple syrup producers depend on a guideline called “The Rule of 86” to help them determine how much syrup they’ll obtain from sap. The Rule of 86 states that the number of gallons of sap necessary to produce just one gallon of syrup is equal to 86 divided by the percentage of sugar in the sap. For instance, if your sap is 4% sugar, which is definitely on the high side, you’ll need an astounding 21-1/2 gallons of sap to produce one gallon of maple syrup. Usually, the percentage of sugar in sap will be substantially lower than 4% (2% is the figure I’ve seen most often) so you’d need even more sap. This is a big part of the reason that real maple syrup is so costly! A thermometer or hydrometer is used to determine the point at which the syrup is done boiling. The finished syrup can be a fragile product. 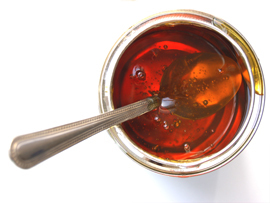 If it isn’t at a high enough temperature when packed, or if it hasn’t been boiled for a long enough time for sufficient sugar concentration, the syrup can ferment or become moldy. Because sap doesn’t keep for long before boiling, it’s not unknown for sugarhouses to be in operation 24 hours a day for much of sugaring season. This is only the most basic of explanations, of course. There are innumerable other variables to take into account if you produce maple syrup. So, what’s the deal with conventional versus organic syrup? The Cornell Sugar Maple Research & Extension Program, one of the sources of information for this article, notes that “The overwhelming majority of maple syrup is produced in forests where no herbicides or pesticides have been applied. Therefore, most maple syrup would be considered organic.” I am unable to find a date on this site, but it looks recent. I’ve seen claims from other sources, too, that all real maple syrup is organic, but that just isn’t so. Organic production of anything involves more than just non-use of herbicides or pesticides, though that’s a good start. Organic production also involves specific practices such as the use of only permitted cleaners to clean equipment and the coding of syrup by batch for quality control purposes. Some producers use chemical agents to control the foaming when the sap is being boiled; organic producers are not allowed to do so. There’s also the issue of formaldehyde. Yes, formaldehyde. Years ago, formaldehyde was fairly common in maple syrup production. When farmers tap trees, the taphole closes naturally after 4 or 6 weeks. Farmers would place formaldehyde pellets into tapholes to keep the holes from closing so the sap would continue to flow; it’s a lot less work to drill a hole only once during the season, after all. At the end of the season, any remnants of pellets, which dissolved gradually, would be removed, and the holes would then close. I’ve also read that formaldehyde pellets would reduce bacteria in the collected sap and result in a lighter-colored syrup, which many Americans prefer. Since the 1990’s in the U.S. and slightly later in Canada, the use of formaldehyde in maple syrup production has been strictly forbidden, but reports on the prevalence of its use are contradictory. L.B. Maple Treat, a Canadian producer, states that producers (at least in Canada) are subject to regular government inspection without advance notice, and “as far as we know no one uses formaldehyde any more.” However, some organic producers and several websites claim that there’s “an alarming presence” of the use of formaldehyde. Organic producers of maple syrup are subject to stringent inspections, and it would be exceptionally difficult, if not outright impossible, for them to use formaldehyde without being caught or having its presence detected. Organic guidelines also limit the numbers of taps per tree; conventional maple syrup producers are free of such restrictions. Limiting the number of taps per tree is a big step toward sustaining your maple syrup production for a long period of time. Tapholes will eventually heal completely, but this process can take up to three years. And you must be certain that this year’s holes are far enough away from last year’s, if you’re concerned with the long-term health of your tree. Given the fact that you can’t even start tapping a sugar maple until it’s somewhat mature, you’d think that everyone would tap wisely, with a view toward the long-term. Sadly, however, this is not the case. And there are different kinds of taps, too. A few producers use what is sometimes called a “health spout,” with diameter and circumference one-third smaller than other spouts. 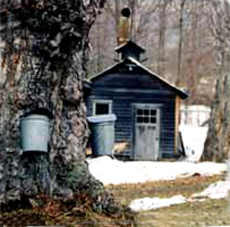 Health spouts were introduced in 1999, and research at the University of Vermont’s Proctor Maple Research Center indicates that these spouts reduce injury to the tree by as much as one-half to two-thirds. So why don’t all producers employ them? Because using a health spout reduces sap yield about 20%, and that’s not acceptable to everyone. Finally, a word about the different grades of maple syrup available to consumers. 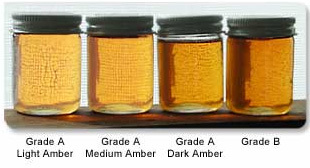 There are three types of Grade A syrup—Light Amber, Medium Amber, and Dark Amber—as well as Grade B syrup. The different colors of maple syrup. Photo courtesy of Coombs Family Farms. As you’d expect, Light Amber is the lightest in color and most delicate in flavor; it’s usually made early on in the season. Medium and Dark Amber have progressively more robust color and deeper maple flavor. While Medium Amber is the most popular grade, all three are widely available. And then there’s Grade B. While not yet as readily available as any of the “A” Grades, “B” has become more popular in recent years, and, I think, deservedly so. It’s very dark in color, with a pronounced maple taste. Once reserved primarily for cooking and baking, Grade B is finding wider use as a table syrup, and it’s my favorite grade of maple syrup (it works brilliantly in cooking/baking, though, especially in homemade applesauce or baked apples). There’s a fifth, commercial grade of maple syrup, but I’ve never seen that available to consumers. Arnold Coombs, of Coombs Family Farms, tells me that the USDA requires this grade of syrup to be sold in nothing smaller than a 5 gallon jug, as they seem to believe consumers would confuse this commercial grade with other grades if allowed to purchase it in the smaller containers typically associated with any of the Grade A or Grade B syrups. No matter what grade of maple syrup you favor, make sure you buy only syrup that’s 100% maple—no blends or table syrups can take the place of the real thing here. And please do think about purchasing organic maple products, as they use processes that can only benefit all of us in the long run! Coombs Family Farms works with other local maple farmers to produce maple syrup, maple candies, and maple sugar. All of their syrup is certified organic, ditto their maple sugar. (As the organic certification process is expensive, they do not believe there’s sufficient demand or justification to get the separate facility used to make their maple candy certified organic at present, but that may come in time.) 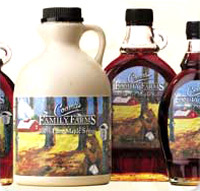 Coombs Family Farms is a seventh-generation maple farm with a strong belief in good stewardship of their land and trees; that alone should greatly encourage you to try their products. 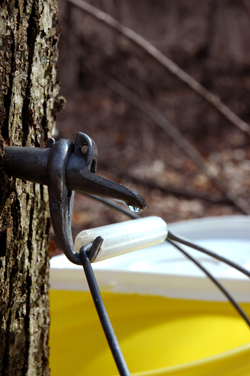 This farm uses the newer health spouts and encourages other maple farmers working with them to use these spouts, as well; they also provide training in proper practices regarding tapping and tree management. While their forest management practices justify a purchase of their products, their syrup (the only product of theirs I’ve tried) justifies becoming a repeat customer! The Coombs Family Farms syrups I’ve tried (Grade A Dark Amber and Grade B) both had a distinct, genuine maple flavor. Either would be a perfect partner for pancakes, waffles, oatmeal, or vanilla ice cream, for that matter. This company also offers three pancake mixes; of those, the Buttermilk & Maple is organic. The products are also certified kosher by KOF-K.
Distribution of these products varies by state. Head over to www.coombsfamilyfarms.com for more information on products, practices, and recipes that prove maple syrup isn’t just for breakfast anymore.